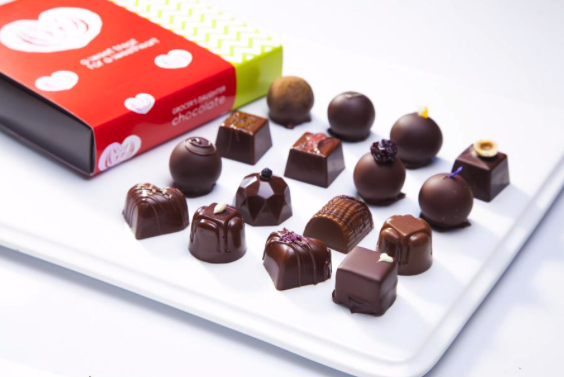 Doesn’t matter if your love is a pint-sized peanut, a vegan, or an ultra-picky chocoholic — Grocer’s Daughter Chocolate in Empire has the last-minute Valentine’s Day treats you need to show you’re sweet on her or him. Run in and pick up a couple petite heart-shaped chocolate lollies ($2) for your little, or a 4-, 6-, or 16-piece box of vegan or non-vegan truffles ($10.50+) for your big … crush. We have our hearts set on the 16-piece Truffle and Honey-Caramel Collection, $38. Not near Empire? Traverse City folks who order online fast can have their order delivered Feb. 13 or 14 to TC’s Darling Botanical — where an array of beautiful accompanying bouquets and plants await. Visit the funky green chocolate shop at 11590 South Lacore (M-22) in Empire or www.grocersdaughter.com to see the full menu of options.